Phillip Grimshaw was born at sea, reportedly on the ship The Seven Sisters, in about 1838-1840. His parents were James and Eliza (Fraser) Grimshaw, who most likely were from Scotland, possibly Kilmarnock. Phillip apparently spent time in Canada or the U.S. as a boy, and he joined the Navy (believed to be the U.S. or Canadian Navy) as a young man. He had a brother – probably a twin – on board the same ship who was flogged so severely that he died. He was buried at sea near the island of St Helena in the Atlantic Ocean. Not long after, Phillip “jumped ship” in Dundee, Scotland, where settled and raised a family. He married Mary Ann Hamilton on August 1, 1865, and the couple had at least three children – Isabell (1865), Mary (1866) , and Eliza Jane (1869) Grimshaw. The first two were were born in Dundee, and the third was born in Perth, and that’s where Phillip died in 1919 and Mary Ann in 1928. Thanks go to Alex Barclay for providing information on Philip Grimshaw for this webpage. Also to Lawrence Hay for posting information on message boards that have helped develop the “story” of Phillip Grimshaw and his family line. The chart begins with Phillip’s parents, James and Eliza (Fraser) Grimshaw. Alex Barclay has conducted extensive research on Phillip Grimshaw’s family line. In response to a request for information in November 2008 for this webpage, Alex kindly provided the following information via e-mail. Below is the sum total of my Grimshaw info – you are most welcome to post it. Before he died in 1989 my uncle Alberto Braccini Barclay told me the following information (in quotes) . So far I have not been able to verify any of it. I have read that the Seven Sisters shuttled back and forward between the UK and Pictau / New Glasgow in Nova Scotia Canada. There are several places called Lower Falls in North America, the nearest one I have found to Pictau is in Vermont. It is possible but by no means certain that Phillips Grandrather was a resident there in earliy (ish) american colonial times. I do not know if there are / were / have ever been any Grimshaw families resident in the Lower Falls area of Vermont. I believe that the information on the internet about James also being born at sea aboard the Seven Sisters is not correct and is an error. I have speculated that Phillip and his brother may have served together in the american(??) navy together and that after he witnessed his brother being flogged to death, Phillip may have subsequently jumped ship in Dundee Scotland. Phillip married Mary Ann Hamilton 1st August 1864 in Dundee Scotland. Phillip does not appear in the UK register of Births at Sea which goes back to 1835 but which is not necessarily complete. I see from this site that many of the Grimshaws came from a village called “Grimshaw” near Blackburn in Lancashire. I live about 20 miles away and so I took a drive out there to have a look. There are only a few modern houses there and a few old industrial buildings – the rest is fields. I looked up the word Grimshaw in the online searchable back issues of The Times newspaper. I found that there were riots there (and also in the surrounding region) in 1830 / 40 resulting from mass unemployment among mill workers caused the introduction of power looms. As a member of the LDS church (the Mormons) I was fascinated to learn that many of the Grimshaw families and villagers joined the first established branch of LDS church in Preston (15 miles away) and they walked there and back every Sunday before eventually travelling to Liverpool and emigrating Utah. I have not yet searched through the early membership records of the Preston Branch of the LDS church. I have not yet been able to make any connection between Phillip Grimshaw and the Grimshaw families at Grimshaw village in Lancashire. It is very tempting to think that he may have come from Scotland originally, but it is equally possible that he simply ended up there after jumping ship in Dundee (a port). Lawrence Hay has posted messages regarding this family line on several genealogical message boards. These messages contain significant information and are therefore provided below from a companion webpage on this website. The Grimshaws of Kilmarnock were found to be recognised by the name of Fraser. The birth of James Fraser according to the 1881 census was given as registered in Boston U.S.A. Investigation has uncovered that there was no registration in Boston of James Fraser between 1800 and 1849 or in the annex towns between 1629 and 1912 if anyone can help it would much appreciated. Philip Grimshaw was born on board a ship called The Seven Sisters about 1839 The ship was registered in London, but I believe that his registration was in Boston. I am looking for Grimshaws who may have lived in the area of Nova Scotia between 1800 and 1830. I have had information that a Grimshaw was in the Canadian navy sometime between 1845 and 1865. The story is that a Grimshaw was executed by the authorities for mutiny. Another story is that he jumped ship in Scotland and settled there. 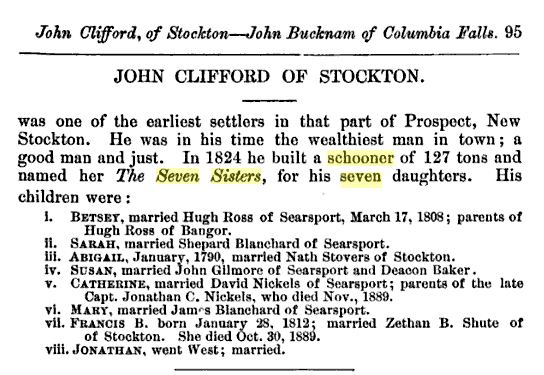 Lloyds Register of Shipping can give no clue to the “SEVEN SISTERS” after 1840. No ship that name after that date. It was a Brigantine and was classed as having been captured. can anybody give me any information about this ship. It seems strange that father, mother and son should be born at sea aboard a vessel that had a dubious reputation of having sailed between London and Pictou in Nova Scotia. It was built in 1784 and according to Lloyds its lifetime was 14 years, and yet it was still supposed to be sailing in 1840. In January 2000, Lawrence posted the following message. The 1881 Census states that Mary Ann Grimshaw was resident at 138 Lochee Road Dundee and her Daughter Eliza Jane was also mentioned. I find it very strange that her husband was not named nor were her other two daughters Mary and Isabella. Isabella was my Great Grandmother and I have her death Certificate from 1939. Can anybody help in my search. I am looking for any information about the family of Richard Fitzgerald who married Mary Barclay somewhere between 1915 and 1925. To her family she was referred to as Needle. David Barclay Married to Mary Grimshaw about 1885/1899 in Dundee, but went to live in Glasgow in the Area of West Graham Street. Daughter lived in the Great Western Road Glasgow. I knew her as Auntie Needle. The Mystic Seaport website includes records of The Seven Sisters from the “American Lloyd’s Register of American and Foreign Shipping” from 1859 to 1873. The earliest and latest of these records are shown below. According to these records, the schooner was built in 1834 (ten years earlier than indicated in the John Clifford record above) in Prospect, Maine, and it was rebuilt in 1855. It belonged to the Boston port in 1859 but to the Addison port in 1860 and thereafter. The ship’s Captain was O.C. Crowley, and it was owned first by the Captain and then by J Crowley. There is also an image from the 1858 New York Marine Register (a year earlier than the above records); it is shown below. It also shows a home port of Boston. 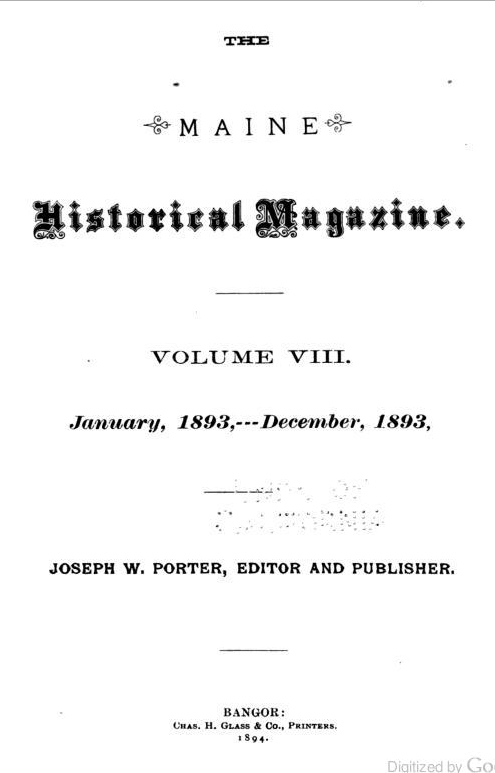 It was owned and operated by Captain Atwater, and apparent predecessor of O.C. Crowley.